Have you ever wanted to swim with a dolphin? Discovery Cove Florida is situated across the road from SeaWorld Orlando and is a very exclusive theme park as each day, admission is strictly limited to around 1,300 guests and you must make a reservation and buy your ticket in advance, you cannot simply turn up on the day and hope to get in. There are two basic options, either a Day Resort Package which gives you access to all the “free” facilities or an All Inclusive Dolphin Swim Package which also allows you to swim with a dolphin. There are also several “add-on” experiences which are charged separately. You should book up well in advance if you plan to visit Discovery Cove around main holiday times like Easter or Thanksgiving. Discovery Cove is never overcrowded, you will not find turnstiles and lines like other parks. It is open all year round and the water temperatures are kept fairly constant. In the winter though it may not be really warm enough to lounge on the beach. Wet suits (long or short) or swim vests must be worn when in the water for safety reasons. The temperature in the main tropical lagoons is warm at around 30 Celsius, 86 Fahrenheit. The Dolphin Lagoon is kept at a cooler 25 Celsius, 77 Fahrenheit. As soon as you arrive at Discovery Cove Florida, your are aware of its intimate and very personal feel. For a start there is the option of valet parking (though the main car park is only a short walk away) and because of the limited numbers, the park never feels crowded. 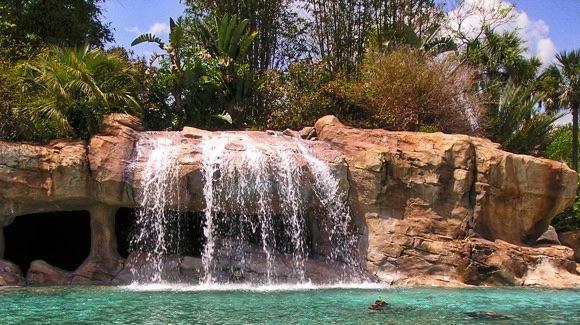 If you do not have your own car, Discovery Cove do offer complimentary transportation from the nearby SeaWorld park. Firstly you are greeted in family groups in the main reception and individual photo-ID cards are made up for each party member. To save the hassle of carrying money around with you, you can register a credit card on your ID and then use it to pay for food or gifts throughout your stay. Note that complementary food and drinks is included in the price of the ticket. A guide then takes you to the main facilities (with a stop for a family photo portrait - included in the ticket price) and shows you to the changing facilities and locker areas where you collect your mask, snorkel, beach towel plus wet suit or jacket to wear whilst in the water. You get to keep the snorkel when you leave. They also supply you with special sun cream that is suitable for use in the water with the various fish etc. The only things you need to bring are a swim suit, clothes to wear if you want to get changed and perhaps pool shoes. You do need pool shoes for some parts of the “Trainer for the Day” package. Also be aware that for the safety of the animals, the only jewellery you can wear is a wedding band and a watch. If you have chosen to swim with the dolphins then you will be given a time slot and location to meet up at prior to the swim. Discovery Cove provides a complimentary breakfast and lunch plus snacks and both alcoholic and non-alcoholic drinks are included in the admission price. As all meals are inclusive Discovery Cove do not permit other food, drinks or coolers to be brought into the park. If you suffer from any allergies or have specific dietary requirements then you should discuss these with the catering staff. The ticket also includes 14 days of admission to both SeaWorld Orlando and Aquatica. An optional upgrade allows you to include Busch Gardens as well plus free parking. For the rest of the day, you can do as you please; there is no sense of urgency or having to queue. Some attractions are included in the standard package or dolphin swim package whilst others (as noted below) are chargeable extras. When Discovery Cove opened in 2000 it really had just two main areas; the dolphin lagoon and the tropical reef, aviary and river. In 2011 a new reef, the Grand Reef plus SeaVenture was opened and in 2012, the Freshwater Oasis replaced the original tropical reef. If you are a non-swimmer or not particularly good swimmer you can still enjoy your visit to Discovery Cove. Life jackets which keep you afloat are provided for those who need them which allow you to explore the various lagoons including the Grand Reef or the dolphin swim. Guests with disabilities can be catered for and manual wheelchairs with oversized wheels are available which are useful when trying to access the beaches. Serenity Bay offers relaxing swimming in 85 degree crystal clear water surrounded by palm trees and beautiful sandy beaches with loungers and hammocks. The theming is fantastic, you feel like have washed up on an idlylic tropical island. There is also the Wind-Away River that you can swim around but be aware that after swimming through the waterfall, the water is over 6ft deep so if you do not like swimming out of your depth, get hold of a life-vest before you start the swim as there is only one place to get out (at the aviary, near the beginning). As you drift down the river you pass through underground caves, dense rainforest and waterfalls. The Freshwater Oasis opened in 2012 and you can wade around or float in it whilst on the lookout for playful otters and marmosets in the rainforest canopy. There is also the 2.5 acre tropical coral Grand Reef area with white sandy beach where you can snorkel amongst over 100 species of tropical reef fish and sting rays; there are waterproof laminated cards showing you all the different species. Reef sharks can be seen through the sides of a sunken shipwreck (but you do not need to worry as they are separated by a thick glass pane) or from a rope bridge. In the free flight Explorer’s Aviary (which can also be reached by a path) you can walk amongst hundreds of highly colourful tropical birds and guides are on hand to give you small cups of food with which you can hand feed some of the birds. Discovery Cove offers a number of “add-on” experiences and the one thing that sets Discovery Cove apart from all the other wildlife water parks is the Dolphin Swim experience. See the Dolphin swim page for full details. Introduced in July 2017 are two new experiences; swimming with sharks and feeding rays which join the SeaVenture experience and Trainer for a Day package. All these experiences are separately priced and Discovery Cove donates 5% of the proceeds to the various marine charities including the Rising Tide Conservation and the Guy Harvey Ocean Foundation. Check dates and times as not all experiences are available every day and some take place at specific times. To participate in these experiences you have to be comfortable swimming out of your depth. The Shark Swim experience starts with a talk with an expert aquarist in the shallows where you learn a bit more about sharks. You can then swim alongside several species of shark. The other new experience is Ray Feeding. You can join Discovery Cove’s aquarists and help to feed Cownose and Southern Stingrays. This is followed by a feeding session with the thousands of tropical fish at the Grand Reef and a private guided swim of the reef. At the SeaVenture Sea Walk experience you don a diving helmet, climb down a ladder and undertake a walking tour of the reef floor. There is the opportunity to observe sharks through a panoramic window, meet and touch shoals of fish and rays. The whole session is about 45 minutes long including around 20 minutes under water, maximum group size is nine. You do not need to be SCUBA certified but you must be at least 10 years old. The ultimate experience is the Trainer For A Day package. With this package you get a second deep-water interaction with the dolphins including a private photo session with two dolphins, a behind the scenes tour of Discovery Cove, shadowing a trainer for the day, meet-and-greets with some of Discovery Cove’s mammals and tropical birds and feeding tropical fish at the Grand Reef. You also get the use of a digital underwater camera to capture those special memories and you get to keep the SD card at the end of the day. Minimum age is 6 and all children under 13 must be accompanied by a paying adult who is also doing the trainer for the day experience. Maximum group size is nine. It is not unknown for Central Florida to be hit by the occasional hurricane and in common with some other parks, Discovery Cove operates a “Peace of mind” hurricane policy. If Discovery Cove or your own hometown is threatened by a tropical storm or hurricane, then Discovery Cove will offer you a refund or reschedule your visit at no extra cost if the tickets were booked through one of the SeaWorld operations. Like all water parks, Discovery Cove may have to shut at very short notice in the event of a threat of lightning strikes. In August 2011, three guests and five park employees were hurt following a lightning strike. Luckily none were hit directly and all recovered.